Find A Reason To Visit All 50! 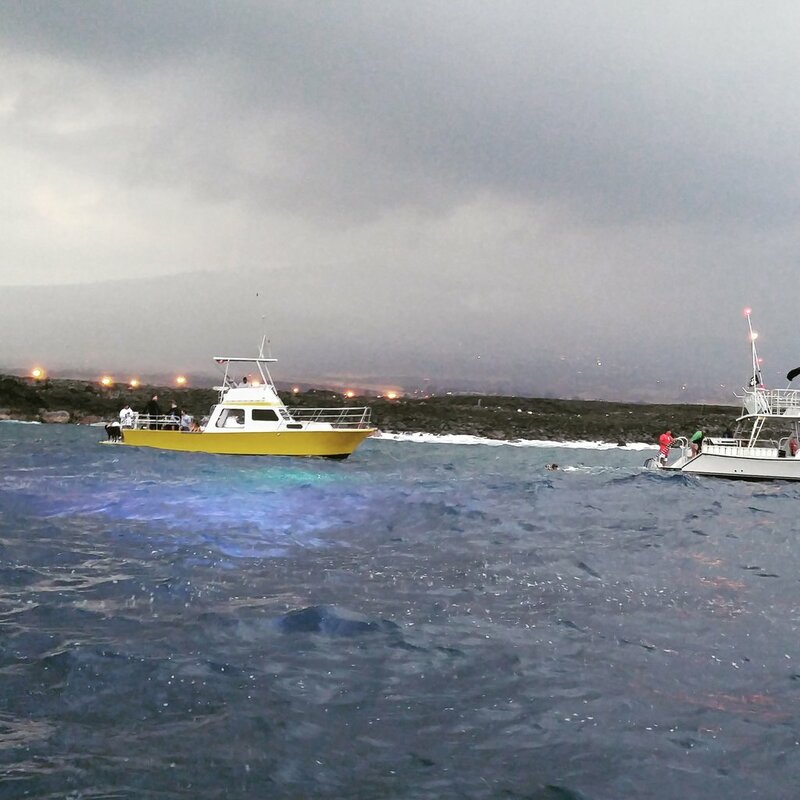 Manta Ray Night Snorkel in Kona – Was It Scary? Cover photo is a Scenic States photo from the Georgia Aquarium. The Manta Ray Night Dive/Snorkel off the coast of Kona, Hawaii is certainly a bucket-list attraction. 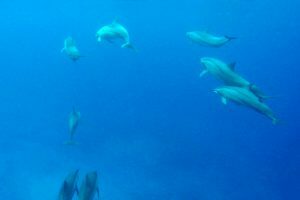 It has made many lists such as CNN’s 50 Best Dive Sites, National Geographic’s Top 10 Things To Do In Hawaii, and PADI’s Top 5 Places To Scuba Dive With Manta Rays to name a few. If you are planning a trip to Hawaii, your question certainly isn’t “how great is the manta ray swim” but rather, “how scary is it?” I’m here to answer that for you. I think of myself as a pretty adventurous person. My sister once accused me of not knowing the meaning of the word “scared” but I don’t know if that’s completely accurate. 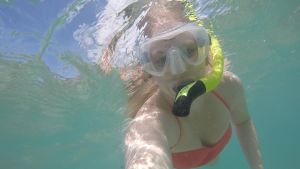 I’ve gone snorkeling in the Great Barrier Reef and scuba diving in the Caribbean. I’ve gone on numerous zip line adventures around the world, ridden a bicycle down a volcano in Maui, climbed the Sydney Harbour Bridge, and repelled down a cliff in New Zealand. I’ve taken a flight lesson where I was allowed to fly the plane in Pittsburgh. I’ve gone on a helicopter without doors in Kauai, rode on a float plane in Alaska, and even jumped out of a perfectly good airplane in Austin, Texas. But that doesn’t mean I’ve never been scared. Before experiencing the manta rays I had quite a few questions that I struggled to find the answers to. I’m going to answer some of them now to help you decide whether the manta ray night snorkel is right for you. What do manta rays look like and how close do they get to you? Watch this video from our trip and find out. You seriously want to go into the ocean in the middle of the night? Yes and no. Mostly Yes. It was still light out when our boat left for our adventure. It was dusk by the time we arrived at the manta ray site, so not exactly the middle of the night like I had expected. Regardless, the water looked pretty dark. This was partly due to the depth of the water and partly due to the lack of sun shining down on it. There were plenty of boats already there and many more that arrived after us. All of them had bright lights. Jumping into the dark water at night was not as scary as I had expected. I think this was mostly due to the number of people and lights that were surrounding us. Can you see the mantas if you stay on the boat? A family of three was part of our tour group. The mom and daughter went into the water and the dad had no intentions of leaving the boat. When we got back on the boat I asked him whether he was able to see the mantas. He said he could sort of see one when it came near the surface. My advice – get in the water. Even on a night with a lot of mantas, the experience is not the same if you stay on the boat. Should I snorkel or scuba dive? I couldn’t answer this in a couple simple sentences. Instead I wrote a whole separate article to help you choose which option is best for you. Yes. There are two primary sites for the manta ray night swim. One is by the Kona Sheraton and one is near the airport. The tour company I used went to the airport site. As you can see in this picture, the shore is not far from where the boats anchor. However, the airport site has a rocky coast so don’t have any expectations of swimming up onto the beach. The Sheraton advertises that you can observe the manta rays from the shoreline most evenings, so I’d certainly expect that boats don’t anchor very far from shore at that site either. Will the manta rays show up? There is no way to know for sure. The manta rays are wild and not forced to be there. Some nights a lot of mantas will show up and others there might not be any. This is one of the most magical aspects of seeing them in the wild as opposed to an aquarium. A lot of tour companies will re-book you on another tour or give you a discounted rate for a second try if no mantas are there. Make sure you ask about this before booking. If swimming conditions are not safe then the tour company will cancel the trip. Keep this in mind when booking. Don’t plan this for your last day in Kona just in case you need to reschedule. Are other fish there too? Yes! I wasn’t expecting this. Other fish are also attracted to the plankton buildup around the lights. They are small compared to the manta rays but big compared to the colorful fish you normally see while snorkeling around coral. This trip was different. There was no shark talk or any mention of sharks at all. This leads me to believe that sharks are never seen in this area, or at least are very rare. Will the mantas sting or bite me? No. Manta rays are not harmful to humans. Unlike their relative, the stingray, mantas do not have a barb or stinger. It cannot sting you. You also don’t need to worry about being bitten. Mantas are filter feeders. They swim with their mouths open collecting plankton, microscopic organisms living in the ocean. 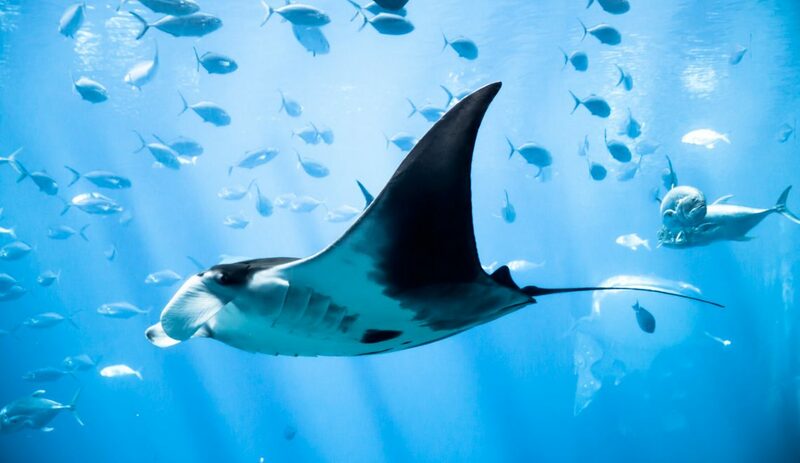 Why do the mantas swim in circles? If you are lucky enough to see manta rays on your trip then you’ll notice that the do barrel rolls while swimming near you. They only swim forward, they don’t have reverse. Since they are filter feeders they have learned that swimming in circles is the quickest way to keep going past the lights where all the plankton is gathering. Can you see the ocean floor? Yes. Normally scuba divers intentionally try not to touch the ocean floor. Their goal is to stay neutrally buoyant. They do not want to sink or surface, they want to stay at the depth that they swam to. This is an exception. Scuba divers on the manta ray night dive want to sit on the ocean floor so they do not accidentally swim into a manta and harm it. The visibility is fantastic. From the surface the snorkelers can see the scuba divers and their lights sitting on the bottom. Since it is dark outside it is difficult to see the mantas when they are not directly in the light of a group of snorkelers or scuba divers. This is one experience where you want to be surrounded by lots of tour groups. When more people are in the water there are more lights, and when there are more lights there are more plankton and therefore you are more likely to see mantas. It feels colder than it does during the day time or in shallow areas at the beach. You are still in Hawaii though, so it never felt uncomfortably cold. Tour companies give out wet suits to help keep you warm. We were in the water for about 45 minutes. I didn’t notice feeling cold while I was in the water but when I got back onto the boat it was a bit cold. Our tour had a hot water hose on the boat to help you warm up and rinse off the salt water. The captain handed out hot chocolates and everyone was drying off with towels and putting their clothes back over their bathing suits to warm up. Do I need to be a good swimmer? You aren’t going to be doing much swimming on this tour. Your entire tour group (about 10 people the night we went) all stick together by holding onto a large device seemingly made out of a surf board, PVC pipe, and flash lights. A guide from the tour company maneuvers the floating surf board around to get you into a good manta viewing area. You might not be comfortable doing this tour if you can’t float on the surface well enough to snorkel. The point of the surf board isn’t to keep all 10 people afloat, it is to keep you all grouped together. If you aren’t confident in your floating abilities call your tour company before booking. They may have a noodle or some other small flotation device you could use to make you feel more comfortable. Yes. Our tour had two families with children. The youngest girl looked to be about 10-12 years old. Ask the tour company before booking to make sure they have child sized wet suits and snorkel masks to accommodate your family. Don’t be. From the moment you get into the water until the moment you are back on the boat you are holding onto the surf board with your whole tour group. This is not a normal snorkel trip where you are swimming around on your own. You won’t be left behind. Many different companies offer tours for this adventure. I used Kona Ocean Adventures and had a great experience. They gave a short educational presentation about the mantas before getting into the water and enthusiastically answered questions throughout the tour. The captain did a great job of telling us when to get into the water and the guide got us into great position so that the mantas came right up to us. I highly recommend booking with them. Do you have any other questions that I didn’t address? Ask them in the comment section below and I’ll get back to you! 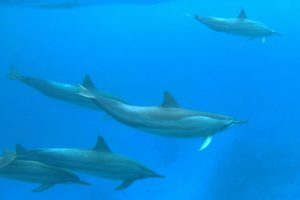 Hawaiian Spinner Dolphins – Should You Swim With Them? Thanks for writing this. I’m just about to go in the next 1/2 hour and was starting to get nervous. Now I feel confident that it’s going to be a great experience! You’re welcome! Stop back afterwards and let us know what you thought about the trip and if you saw any mantas! Thanks for pointing out that getting in the ocean at night isn’t all that scary when you have other people and lights surrounding you. You also said that if you stay in the boat, you might have a harder time seeing the manta rays. I think it’s a good idea to do night dives when it’s warmer outside since the water tends to get even colder at night.